We've been home with the baby for about a week and a half. Things have been going pretty smooth so far. Last night Jason did his first bottle with Isla, and that gave me about 5 hours of consecutive sleep! I feel like a new woman. My frozen meals have come in handy. Plus, we had a few friends bring us meals (thank you, Carlins and Lindsay!) My "job" since we have been home has been to feed Isla, and boy does she like to eat. I had no idea that this was going to be so time consuming (8 hours a day!). After the first few days, nursing boredom has set in- movement, arm use, and lap-space are drastically constricted. The worst is when you realize your ______ (phone, remote, magazine) is just out of reach. I'm growing tired of tv- watching and downloaded movies (however, our investment in the Apple-tv has paid off). So, I moved on to reading books. But, that's difficult because my attention span went down the drain with pregnancy. If you have any suggestions on short story collections, please let me know. Today I realized I can balance the laptop on my knee in front of Isla resting on the nursing pillow. I am grateful to have a hungry baby who likes to eat, and find it oh-so-satisfying when she gives me a milk-drunk sleepy smile. Another reason our transition home has been so smooth was due to help from our wonderful Post-Pardum Doula, Tracy Edwards. Tracy came to our house our first week home to help me get a good start to nursing, answer the 100 questions that you didn't realize you had until there was a tiny infant in front of you, cook, do the laundry, etc. Tracy is a mother of 9! Her experience and help was invaluable. Especially in those first few sleep-deprived days when you can't let yourself fall asleep for fear a cat will decide to nap on your infant the second you close your eyes. It was so wonderful to put Isla in experienced hands, and get some much needed shut-eye for an hour or so. If you or someone you know in San Antonio could use a Tracy, you can reach her at (210) 478-7248. She's working on her website, I'll attach the link later. It was a bit scary to say good bye to Tracy and know we are "on our own." But, never fear! A parade of Grandparents is near! Thursday Jason's parents arrive for a week of Isla snuggles. Then, my parents for the Easter weekend and following week. Photo 1: my "vantage point" 8 hours a day, All Mine. By the way, Jason photographed this "safari style" crouching up on the back corner of our sectional. Photo 2: Sleeping in on Saturday with Dad. Our baby surprised us last Friday night with a sneaky water break maneuver. First of all, at my doctor's appointment the previous Tuesday, Doc said nothing was going on to indicate anything happening anytime soon, and that she'd be seeing me in the office next week. Also, we were told first babies are more often than not, not early, usually late. Also, the water break scenario only happens in real life about 10% of the time (but 100% of the time in the movies). So, we were taken by surprise when on Friday night, actually Sat morning, stroke of midnight, as were were leaving the movie theatre after going to see Crazy Heart... my water broke. Not a flood, so we went home and assessed the situation, and determined, yes, that was the case. So, we were at the hospital by 2:30 am, and about 13 hours later, after a uneventful and relatively easy labor and delivery, we got to meet our little girl! We thought it was funny when the nurses changed shifts they used the secret code word "vanilla" to describe what was going on. Jason was on to them. Born March 13th, 2010 at 3:30 pm. We named our baby Isla (Eye-la) Rose. Isla because we loved the name, and Rose after her Greatgrandma's, Gizella Rosa and Rosemary, and her Aunt Christina Rose. She weighed 6 lbs 4 oz at birth, and 18 inches long. Isla has long fingers and fingernails, so we suspect she just got tired of the cramped situation, and gave a poke. She was born full-term, but a couple of weeks before due date. She is healthy, perfect, and adorable. So far we see more Lontai in her, she looks like my brothers to me. But I'm sure some Jason features will show up soon. Jason's fancy camera pictures are going to be posted, and updated every few days on his flicker account. 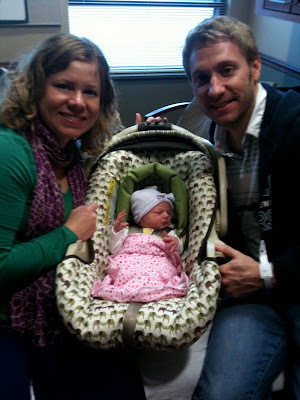 We got to bring her home Sunday evening, and we are all doing great. She is a good eater. She likes to try Houdini moves to break her arms out of her swaddle. I caught her this morning one time with her thumb in her mouth! Right now she is enjoying a little bit of swing time in her swing from Grandma Dolores. I was planning to attach her nursery pics to the previous post, but we had not quite got everything together in the nursery, so I'll add those later. Here is our first family photo! Ready to go home from the hospital. Are you beginning to feel a bit cramped in your present home, feeling tethered, or even upside down? Well I have a once in a lifetime opportunity for you! Plan a trip to Your New Home. At Your New Home, you will have your own personal travel guide, named Mommy. Your mommy will take care of your every need. She will prepare and deliver nutritious meals made just for you, 10 times a day, and room service is available 24 hours a day. At Your New Home, you will have your own private room, which comes standard with European furniture, an upholstered glider, and your own private balcony! You will be lulled to bed at night by the sound of a rumbling train in the distance, and in the morning awake to the joyful sound of the Montessori Preschool's pet rooster. Forgot your suitcase? No worries, your room is already stocked with lots of clothes, books, and toys. For your companionship and entertainment, Your New Home includes a complementary Doggie, and two Kitty Cats. You might also consider taking a dip in your very own pool during those hot summer days. Feeling tempted... well you haven't even heard the best part. Your new home comes with your very own Brand New Daddy!!!! Your Daddy has been hand-picked for you, by your travel guide. Not only is Your Daddy handsome and smart, but he's also funny. The two of you will become fast friends. Your New Home includes a lifetime of unconditional love and amazing opportunities. So act now, your new life awaits! Well, after Jason fixed my computer to the best of his abilities, it continued to behave badly. After a week of dealing with a 10 second delay on mouse pad response, clicking, and key strokes, I'd had enough. Jason said I needed a new computer, and that I should get a Mac. He had expressed this sentiment to me previously, to which I always retorted "I'm a PC." But, after promises of virus immunity and for the sake of our family unity, I decided that I could endure the uncomfortable weeks of learning curve and might come out better for it in the end. So, Jason and I held hands, and walked towards the light of the apple with one bite out of it. I am slowly learning my way around this alien computer, and after a few days of looking at it sideways through squinty eyes, we are now getting aquainted. The nursery is coming together, as Jason has put in many hours of furniture assembly, we just need a few finishing touches. And, my plan for the next few weeks is to cook and freeze "Make-Ahead Meals," attend 3 prenatal yoga classes a week, take Angel on walks, and other various baby-preparations activities (napping? ).